While its speakers could use a boost, this multimedia laptop boasts a crisp 1080p touchscreen, excellent inputs, and solid Core i7 performance – all packaged in an attractive aluminum chassis. In terms of quality, Dell's Inspiron series spans the gamut. Inspiron notebooks range from cheap-looking, plastic laptops that cost less than $300 to svelte, aluminum machines that cost nearly as much as its premium XPS line of laptops. The 7000 series, on the high-end of the Inspiron line, edges toward the "premium" end of that spectrum. The Dell Inspiron 15 7000 is spec'd out in every way: a gorgeous aluminum chassis, a full HD touchscreen, a quad-core Intel Core i7 processor, Nvidia graphics and more RAM than you'll probably ever need. Of course, such premium components command a nearly premium price tag. The top-of-the-line test model sent to TechRadar would cost you $1,149 (about £672, AU$1223). That figure gets bumped up to $1,238 on Dell's website, thanks to the addition of a slightly faster CPU. At first glance, the Inspiron 15 7000 looks like a crossover between a mainstream and premium notebook, sporting an elegant but thick aluminum design. The brushed aluminum lid lacks adornment save for an embossed Dell logo in the center. On the other side, the 15.6-inch display is framed by a glossy black bezel that measures half an inch thick (12.7 mm) at the sides and three quarters of an inch thick (19.05 mm) at the top and bottom. The hinge below the display rotates smoothly and doesn't feel wobbly, though I had to hold the laptop down when I opened the lid. The brushed aluminum finish extends to the deck, which looks sleek with rounded corners and beveled edges. The spacious 4.1 x 3.1-inch (104 x 78 mm) trackpad is slightly off-center to the left, and the deck offers plenty of space for the wrists to rest comfortably. The backlit, island-style keyboard rests in a slight depression and includes a full-size numeric keypad on the right. The power button is located at the top left corner of the deck. The laptop boasts a fairly robust selection of ports. On the right, you'll find an Ethernet port, HDMI-out, two USB 3.0 ports, a headphone/mic combo jack and an SD card reader. Two additional USB 3.0 ports are located on the left. At 14.9 x 10.0 x 0.8 inches (W x D x H; 37.8 x 25.4 x 2.03 cm) and 5.7 pounds (2.6 kg), the Inspiron 15 7000 isn't much heavier than the HP Envy TouchSmart 15, which weighs 5.73 pounds (2.6 kg) and measures 1.17 inches (29.9 mm) thick. Nevertheless, it feels chunkier than most premium ultrabooks. When I carried the laptop and power adapter around the city in my bag, I definitely noticed the weight. The $1,149 (about £672, AU$1223) review unit sent to TechRadar shipped with a 1.8GHz Intel Core i7-4500U quad-core processor, 16GB of DDR3 RAM, an Nvidia GeForce GT 750M GPU with 2GB of GDDR5 video memory and a 1TB, 5,400-rpm SATA hard drive. The system handled multiple desktop tasks with ease. The Inspiron 15 7000 is available in three configurations, with the model sent to TechRadar being the most premium. You can pick up the base configuration, packing a Core i5 CPU, 6GB of RAM and a 500GB hard drive, for $649 (about £380, AU$689). Finally, there's a midrange model that comes with a Core i7 processor, 8GB of RAM and a 1TB hard drive for $949 (about £672, AU$1,007). After we had received our test unit, Dell announced that they have upgraded the CPUs on the Inspiron 15 7000 line. 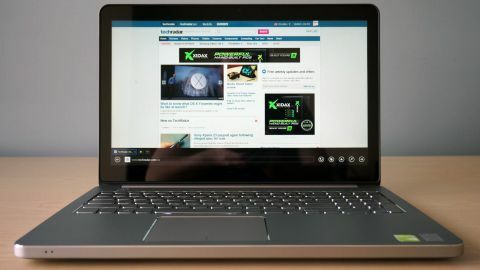 The new top-of-the-line configuration, which costs $1,238 (about £556, AU$1,321), now sports a 2GHz Core i7-4510U processor – all else is identical to that in our review unit.